Chipotle chicken kabobs are a fun snack that is super healthy and rich in flavor. The cooking is fast enough to cook during the week and the dish also makes a satisfying main. The chipotle marinade is one of my favorites when it comes to grilling. It tenderizes a lean cut of meat, keeps it juicy during cooking, and adds tons of flavor to the chicken. Some recipes call for seeding the chipotle peppers. I like my dish a bit spicy, so I left them in. If you do not like your chicken too spicy, be sure to discard the seeds before marinating. 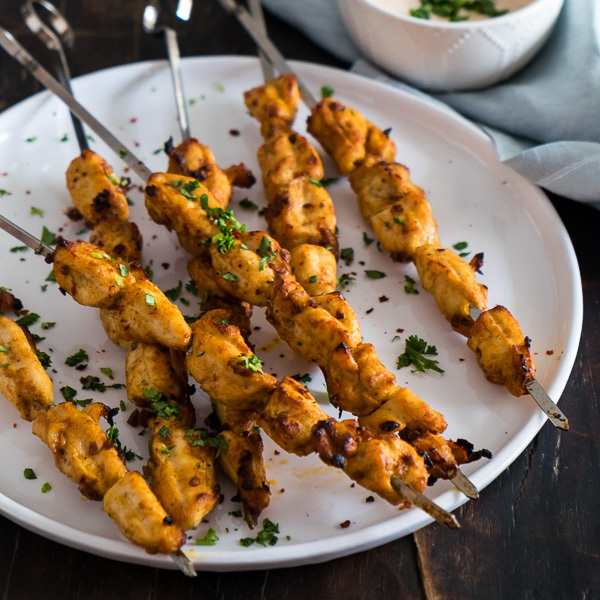 To make successful chicken kabobs, your first step is to cut the chicken into evenly sized bites, so they will cook evenly. Although large cuts are easier to work with, smaller cuts will cook faster and require less time to marinate. For 2/3-inch pieces, 30 minutes of marinating time is enough. That is, slightly longer than the time you need to heat up oven or the grill. For larger pieces, such as 1-inch chunks, you’ll want to marinate for least an hour to make sure the flavor penetrates the chicken. I admit, the best way to cook these kabobs is on a charcoal grill. A gas grill works just as well, but won’t give you the heavenly smokiness. The oven works, too, and it’s more convenient if you don’t want to take the time set up the grill. If you broil the chicken, be sure to monitor the cooking closely, just like you would when cooking on the grill. This way, you can make sure the chicken is properly charred without overcooking it. I created a healthy dipping sauce for this recipe using Greek yogurt. 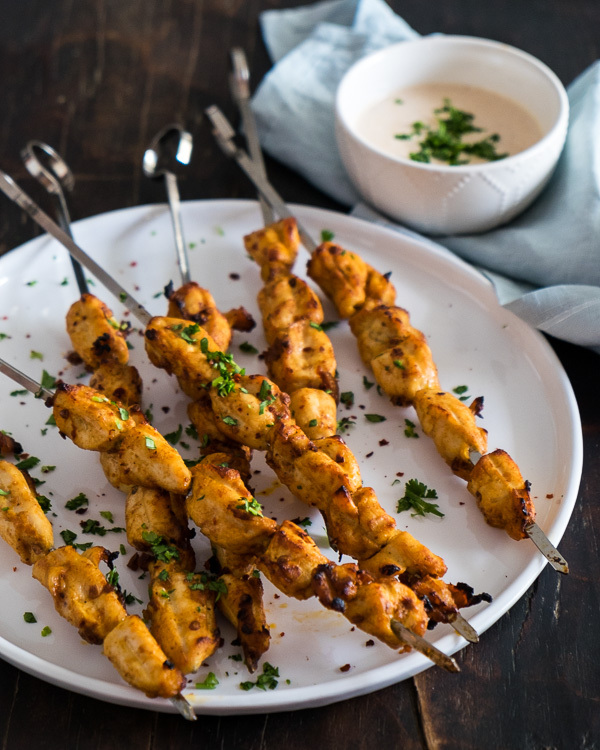 It is creamy and refreshing and goes so well with the skewers. That’s it! Serve the chicken with a simple salad or some grilled bread, and you’re all set for a delicious dinner! Preheat oven to 550 F. Adjust oven rack to middle position. Combine vegetable oil, chipotle, brown sugar, salt, paprika powder, cumin powder, and garlic powder in a bowl. Stir to mix well. Add chicken and the marinade into a gallon sized bag, massage to coat the chicken evenly with marinade. Squeeze out as much air as possible and seal. Let rest in fridge for 30 minutes. Thread chicken onto metal skewers right before cooking. Combine Greek yogurt, adobo sauce, lime, garlic powder, and salt in a bowl. Stir to mix well. Turn on broiler. Line a large baking sheet with aluminum foil. Place chicken skewers on the prepared baking sheet. Cook for 5 to 8 minutes, until the surface is charred and the chicken cooked through. Flip once at the halfway point. You can also cook the skewers on the grill, about 3 to 5 minutes per side.